I had wanted to read Little Bee for at least a year and a half, so I’m surprised it’s taken me this long to get around to it. The only reason it took me as long to finish it as it did was because I was on spring break with friends, so I didn’t have a ton of time to devote to reading it until we were making our way back to school. 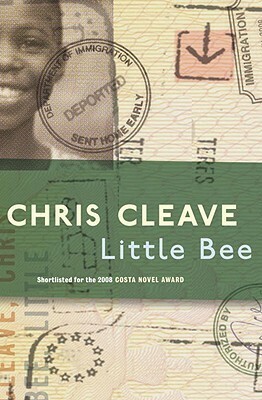 Little Bee is about two women, Little Bee, a Nigerian refugee, and Sarah O’Rourke (née Summers), a British magazine editor. The two meet when Sarah and her husband Andrew go on vacation to Nigeria and meet Little Bee on a beach. The events of that meeting change both of their lives, and two years later, they are forced to deal with the consequences of that fateful encounter. I wanted to love Little Bee. As long as I waited to read it, and as many reviews as I read saying how phenomenal the book was, I was expecting a little bit more than what I got. I loved the writing. The language, especially in Little Bee’s chapters, was beautiful. Incredibly engaging and vivid. But I found it a little bit hard to sympathize with Sarah which, considering half of the novel is told from her point of view, struck me as a huge flaw, not necessarily on the author’s part, but maybe on account of my own lack of experience with what she had to deal with. After discussing the book with a friend, I do understand what Cleave was trying to do — present characters that were more or less morally ambiguous and “explore the human experience” as my friend said — but I still felt very indifferent about her as a character. Out of the four adult characters, the only one that I felt anything for was the eponymous character. I found the husband to be pathetic and a man named Lawrence to just be insufferable. Overall though, after having a couple of days to mull it over, I like the book more than I did when I first finished it. It is not a feel good novel, but it is thought-provoking. If you’re going to pick this one up, I would ignore the editor’s note because it is rather smug. Also note that Little Bee is the American title — in the UK it is sold as The Other Hand. Tagged chris cleave, literature, little bee, the other hand. Thanks, Sara. I was starting to feel like I was crazy for not loving it. I guess that’s to be expected with these kinds of books that get an enormous amount of hype. The higher the expectations, the greater the disappointment if it’s not what you thought it would be. But I did like it, just expected a little more.